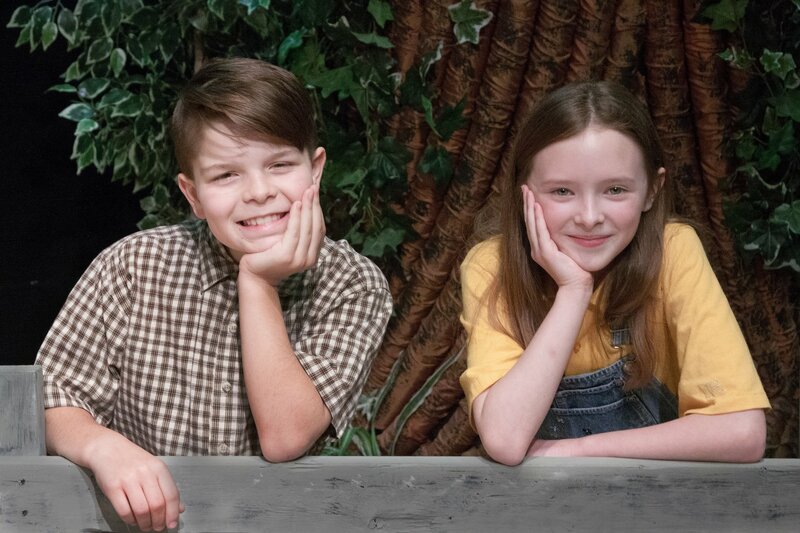 Jackson Smith (left) as Jesse and Morgan Burkhardt (right) as Leslie in DreamWrights’ Bridge to Terabithia. Based on the Newbery Award-winning novel by Katherine Paterson, best friends Leslie and Jesse create their own imaginary kingdom in the woods to escape the realities of home and school. Bridge to Terabithia is a poignant story of imagination, friendship, love and loss that builds a connection to the meaning of resilience. In order to help the companies of the production better learn to portray the bereavement process, Alvarnaz brought in Julia Dunn, Program Director of Olivia’s House, a local grief and loss center for children to help educate the group. 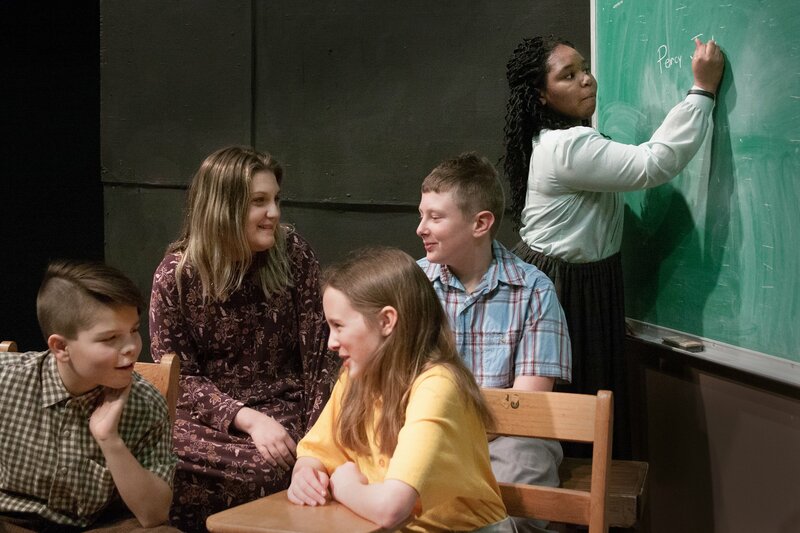 Dunn explains, “We wanted to enlighten the casts on what the Bereavement Process looks like, drawing on specific parts of the script, so that they could comfortably and accurately embody that process.” Dunn says that many of the children in the production jumped right into the discussion about bereavement. Some even courageously shared their own experiences with loss, and related to the experiences that the characters go through in the play. 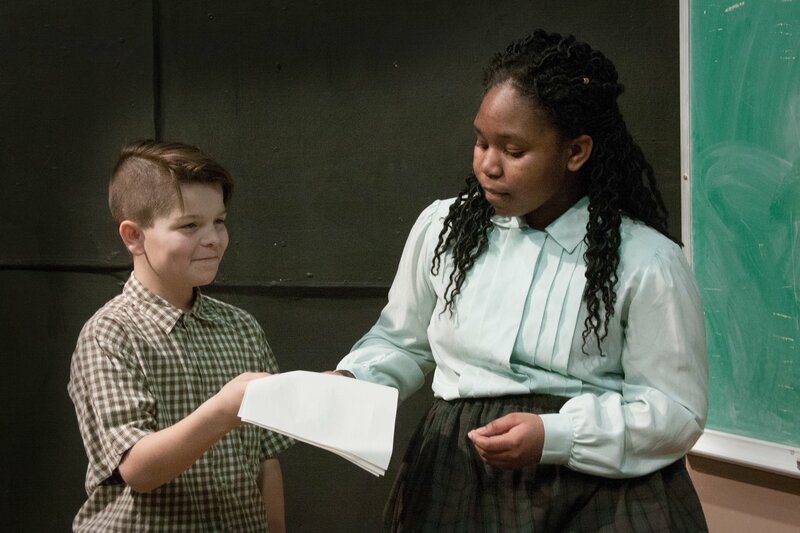 Jackson Smith, Caitlyn Barshinger, Morgan Burkhardt, Zachariah Kessler, and Troi Steele in DreamWrights’ Bridge to Terabithia. Adventure to the Bridge to Terabithia on April 13, 14, 20 and 21 at 7:00 pm and April 14, 15, 21 and 22 at 3:00 pm. Tickets may be purchased online or by calling 717-848-8623. Advance seats cost $11 for general, $15 for reserved. General admission seats at the door cost $13. Some content may not be suitable for younger audiences. Recommended for grades 4 and up. DreamWrights is a non-profit educational arts organization chartered under section 509(a) of the Internal Revenue Code as an organization described in section 501(c)(3). The official registration and financial information of DreamWrights may be obtained from the Pennsylvania Department of State by calling toll free within Pennsylvania, 1-800-732-0999. Registration does not imply endorsement.